With news that scientists have created stem cells that grow into pork, and the very real possibility of in-vitro meat becoming part of our diet, the inevitable question is raised: would it be kosher to eat lab bacon? 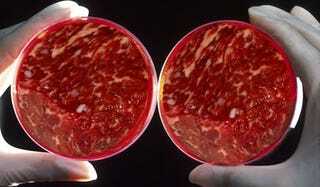 In-vitro or cultured meat shows great potential for feeding our ever growing population. With a bit of work, it would take less area to manufacturer, have a smaller carbon footprint, and be less prone to disease and bacteria compared to traditionally grown farm animals. While we're not quite at the stage yet where we can pump out steaks in a factory environment, there's a fairly good chance it will become a part of our diet in the foreseeable future. But what about people who follow dietary restrictions, like Jews who keep kosher? According to the rules, if a mammal is to be considered kosher, it must have cloven hooves and chew cud. This is why beef is okay, and hare and pork aren't —- no hooves and rumination, respectively. Kosher meat also has to be slaughtered in a very specific way, involving slitting the animal's throat with a sharp, non-serrated knife, and removing as much blood as possible. So, what happens when there's no animal to slaughter? Vat meat can't have hooves, and it certainly doesn't ruminate. Does that mean that no cultured meat is kosher? Or that all of it is? Or does it stick to its parent species? We talked to Rabbi Arnold Bienstock of Congregation Shaarey Tefilla, a Conservative Synagogue in Carmel, Indiana, and asked his opinion on the matter. "The way any religious issue comes down, in the Jewish community, is the more traditional, pious Orthodox Jews have a hard time accepting change, the Reform embrace it, and the Conservatives fight about it," said Bienstock, with dry humor. So it will vary greatly along the various degrees of observation. Bienstock thinks the Conservatives will be hesitant to adopt artificially raised meat, unless it's seen as something completely different to its original form. The Rabbi compared this to two previous cases with kosher food: cheese and gelatin. Both contain animal products which may not be kosher, so specific variations have to be made for people who are strictly Orthodox. On the other hand, the Conservative movement viewed these objects as being so far changed and removed from their original source, that they don't need to be kosher. Says Bienstock, "these elements are re-defined as not really being meat, as the substance is so incredibly transformed. So using [this technology] the Conservative movement might say it's not really meat because it doesn't come from an animal." There you have it. When cultured meat does finally come to a supermarket near you, there's a fairly good chance you'll be able to eat bacon-wrapped shrimp, with your Rabbi's approval.